Synthetic gloves are a cost-effective, looser fitting, non-sterile, powder-free and latex-free disposable glove. Available in small, medium, large and X-large. Disposable synthetic gloves are medical grade gloves that will protect your hands from all levels of incontinence conditions. They make the ideal choice for carers and those with incontinence to clean up any spillages of leakages from bowel or bladder incontinence. Synthetic gloves are a looser fitting than other types of gloves and offer more flexibility at a lower price. 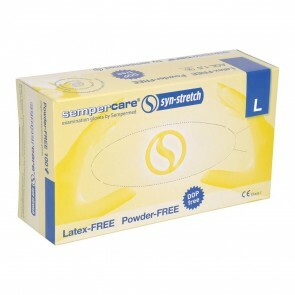 Our range of disposable synthetic gloves are non-sterile, powder-free and latex-free. If you require sterile and powdered gloves, then please take a look at other types of medical gloves in our range. The gloves are stronger than vinyl and more cost efficient over a period of time than nitrile gloves. Synthetic gloves are available in small, medium, large and extra-large. They are clear in colour and available in packs of 100. The gloves are an excellent choice if you want to save money, have more sensitivity and a looser fitting glove.